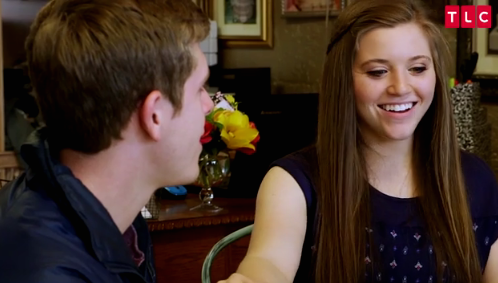 Guess what, Duggar fans? 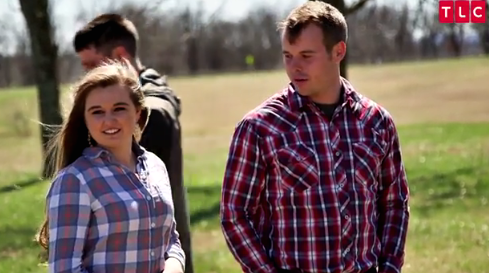 In less than four weeks, the Duggars will return to TLC with new episodes of Counting On! Scroll down to watch the promo video (in a format that all readers can view) and see snapshots, and click here to read the season summary. What are your hopes for season three (premieres Monday, September 11th, at 9pm ET/8pm CT)? Sept. 9 is a Saturday. You mean the 11th. I'm sure they'll eventually be showing the Joe-Kendra wedding that will take place a few days before this season begins. TLC has been spotted filming all sorts of pre-wedding stuff already. 9:50 AM, do we know for sure what date the Joe-Kendra wedding will be? I haven't seen any dates so far. I am so tired of TLC showing the weddings first and the wedding planning later!! How desperate is TLC for viewers of this show? Their desperation is showing! It's like buying a book and reading the ending first. Why bother with the rest?! I'm with you on this. Move on the wedding is over. Now is Joy going to follow her sisters in having babies or follow after Jinger? I agree, 10:40 AM. I was thinking the same thing. We've already seen the wedding and what happened at the reception and now we will backtrack and try to get into the wedding prep again and the wedding all over again. It ruins it for me. I agree especially when it runs to a 2nd season. If they don't have enough to fill the show, time to stop it. They have to keep people interested, the weddings are the big draw after that its just the planning and then it is just the same old same old. I think they should just do a couple of specials every year to keep fans up to date, and leave out the boring stuff. I am excited they are showing the wedding again. unlike some people I never got to go see the wedding and I'm glad it's going to be aired again. can't wait. #love the duggars!!!! Your dates are a little off. Are Joy and Austin having another wedding? I thought they had one earlier this year. Maybe they can rename the show "Counting Backwards?" Judging by the sneak peak, it's going to be a season of rehashed shows!! Come on TLC, give us more up to date happenings. Constant old news is not interesting!!! Sneak peek. A peak is on a mountain. No, Josh is not allowed on the show, so that leaves out the rest of her family. Anon 12:52, they've been on before without him. The rest of his family shouldn't be punished for his choices, and TLC has never banned Anna or her children. Personally I would love to see Anna, I think she is an incredible woman, and deserved so much more. I'm happy that she's been able to move on so graciously. Anna has been on before with her children. I would love to see her and her new baby on the show. But every time Anna and children are on the show, josh gets paid.... would be nice if the money were in Anna's name since she's the one who earned it. I'm tired of people claiming that the "innocent" family members are getting "punished" for what Josh did. There is such a thing as guilt by association. TLC has its network to protect, first and foremost, so they have the final say about what airs and what doesn't. I think they're being gracious to allow even one family member to still be on TV, after everything that happened. Guilty by association??? Are you serious??? My dad was a known drug addict and spent many years in prison. For my sake, thank god no law enforcement of any kind thought myself or my siblings were guilty by association. That's the craziest things I've heard this week, but don't worry I'm sure some other idiot will top you. And as far as TLC's reputation, they lost mine and my communities respect when they pulled 19 Kids and Counting, but left I Am Jazz! I have no problem with what someone does with there body, but I don't care to watch it. TLC is like every other network. Doing everything possible to shove liberalism down our throat. It's funny though, TLC knew they needed the Duggar's for the low ratings they were experiencing so they brought them back!! Same old same old. No new content. Yes and the younger not so "littles" anymore, unless it's the grandchildren. They started showing wedding first because so many people asked not to wait to see wedding. So they were trying to appease lots of fans. I like seeing the wedding first then the prep. Excited for new season to start. In the uk, we're just about to see Jinger get married.. we're so behind..then we never get the full season compleated! I cannot bear to see Jana crying and upset. This is the first time I've ever commented..I just have to say, that is such a precious picture of Joy Anna and Jim Bob. She is treasured (as are the rest) and it shows.. I am sad, can't afford cable any more so I can't get TLC shows. 😐 I miss the Duggers episodes. My hopes for the next season are that it's longer than the summer "season," and that there's new content! hope TLC finally has the entire family featured but i doubt they will - easier to give into the haters. if not the entire family then hope they have more - lots more of Joy and Austin. There is a reason why the whole family are not featured. As someone else posted above fans are lucky the Duggars have a show at all. Jana looks so genuinely sad in that picture where she is hugging Joy. I don't care what anyone says, it must be so hard for her to have all of the older sisters married and out of the house. I agree. She looks genuinely sad in the picture with Joy. It's just my feeling but I believe Jana is staying until the younger girls are a bit older. I think she is really attached to them. Will this include the younger Dugger children and parents as well? Or just the older kids and their families still ? Because Frankly I'd like to see the Whole family younger kids and mom and dad as well just watching the older kids and their families has been rather boring. Frustrated that the network shows the same thing over and over and over. I love the show but didn't we already see Joy's wedding? That means Joe and Kendra are getting married before the premiere. TLC should go back to showing the whole family. Every family has its problems. It's unfair to punish the whole family. The whole family has been on Counting On! I don't want to watch another family's problems. Is that a picture of Michael up top? Looks like they put up two photos of Marcus! Boy they look a lot alike! I don't think that Anna has had her baby boy yet,we definitely would have heard by now,i know that there is the stigma of Anna being Josh's wife,hood news is still good news so I'm sure we will know pretty soon after Anna has her new baby boy. No cable, no streaming so no access. I won't miss all the flash backs or things we already read about. I also hope good choices are made posting concerning topics that won't cancel the show for others or remove members on TLC accounts. Do hope Anna is doing well and delivery safe. Jana has said that there are many guys that have come and said they are interested in her, but they were not right for her. She wants a guy with dirt under his fingernails not an office worker.